I've collected here many different examples of the music I've made in the last 30 years, including released and unreleased albums, commercial music, and private recordings. Each link to the left will take you to another page with the album's cover art (whether as actually released or just as I've imagined it) or a related image for the collection, a listing for each track, and some commentary. I've encoded all these music tracks in stereo as high-quality MP3s. 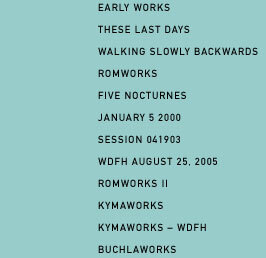 Just click on each track name to play it in your browser. You'll need to have an appropriate MP3 player for your system installed to hear them. In this 11-minute radio interview, I discuss the music and methods of my XI release "Ten Thousand Shades Of Blue" with Jason Lopez on "Don Giovanni Overdrive", broadcast in January 2002 on KALW in San Francisco. Jason played the pieces at full length on his show, but I've edited them down to short excerpts here for easier listening.